We've all heard the saying 'you are what you eat' but how about 'you are what you wear'? Now thanks to an Australian under garment manufacturer, the world's latest technology in performance enhancing yarn is available to anyone looking to maximise their endurance and recovery. The Baselayers Re-energisers range uses new 'smart textiles' that are made using Celliant® technology. These Celliant fibres absorb energy emitted by the body and recycle it back through the skin for improved circulation and increased tissue oxygen levels. Increased tissue oxygen levels have been known to improve performance and recovery for everyone whether you are an elite athlete or just undertaking everyday activity. Baselayers Re-energisers CEO, Greg Lucas said that to many of us the idea that fabric can actually give something back to the wearer may be difficult to grasp. "Celliant® technology gives wearers an unfair advantage. They are infused with minerals that trap the energy our bodies emit, allowing it to be reabsorbed into the skin to increase tissue oxygen levels," he explained. "In clinical tests Celliant® has been proven to increase blood flow and blood oxygen levels and help balance body temperature. Each of these results can have added benefits including increased energy, improved performance, reduced recovery time and better overall wellness. "Even after sport, when you have fatigued muscles, your recovery time can be shortened with increased tissue oxygen levels", Greg says. Men's and women's leggings, long sleeved tees and tanks are available online at www.re-energisers.com and are priced from $39.95. Leggings and long sleeved tees available from selected Myer Men's Underwear Departments. Celliant® is the leading responsive textile technology for apparel, bedding and veterinary products. 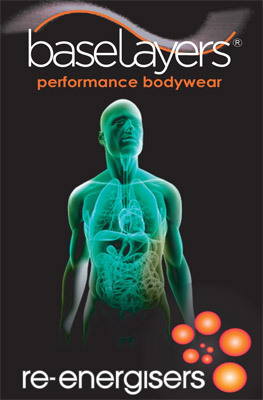 Celliant's revolutionary, patented technology harnesses and recycles the body's natural energy through the use of fibres. Celliant's parent company, Hologenix, LLC, is committed to developing and bringing to market products that improve people's lives through increased cellular oxygen levels. They strive to deliver the future of healthy innovation through a variety of consumer categories. Celliant technology absorbs and stores the electromagnetic energy emissions from the human body and reemits them back into the body, where they are reabsorbed into muscle tissue. The unique technology incorporates thirteen optically responsive minerals, embedded into the core of the fibres, which modify visible and infrared light. These fibres are then knit or woven into fabrics, and when worn or placed near the body, oxygen levels are increased. Review: Exercise seems to be improved, fabric is breathable and comfortable for all day long wear. Baselayers is a trade mark of Brandella Pty Ltd. Brandella is a heritage Australian manufacturer of undergarments and thermal wear, located in Richmond, Victoria. The company prides itself on its technical knowhow and its quality fabrics. CEO Greg Lucas has 30 years' experience in the garment manufacturing industry including 7 years with Brandella.